JAC 10th Exam Routine 2019: Jharkhand Board 10th Examinations, 2019 Time Table has released by JAC. Students can download Jharkhand Board 10th time table from official website, www.jac.nic.in. As per Programme the Jharkand Academic Council (JAC) will be held the class 10 or annual secondary exams from February 20, till March 9. Candidates who are interested to prepare well in advance for the exams can download the jac class 10 time table from the specified below link. Students who are pursuing under jharkhand academic council board will let you know the details of examinations 2019 from the official website after the announcement. The State of Jharkhand came into existence on the 15th of November, 2000. An Act to establish the Jharkhand Academic Council was enacted by the Jharkhand State Legislature and assented to by the Governor of the State on 26.12.2003, which was known as Jharkhand Academic Council Act 02.7.2003. The Jharkhand Academic Council was constituted by HRD Department Government of Jharkhand Notification in 2007. Time: The class 10 or secondary exams will be held in the morning shifts (9.45 AM – 1.00 PM). 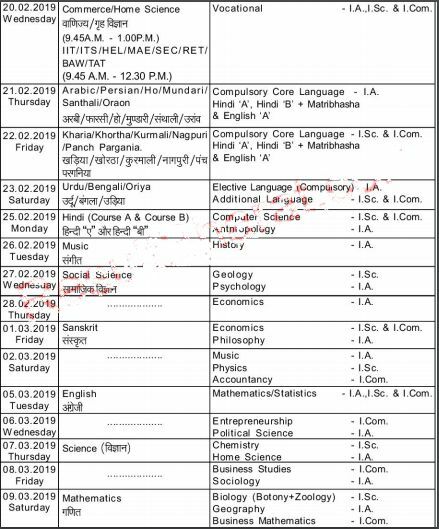 Status JAC Secondary Time Table 2019 is released. 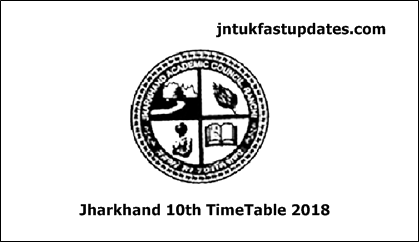 The Students can Download Jharkhand Board 10th Time Table 2019 from the official website: jac.nic.in. The Jharkhand Academic Council started functioning in a rented house in Rameshwaram where previously the Jharkhand Intermediate Council functioned, and the Secondary portion continued to function in Zilla School Ranchi campus. The search for suitable accommodation for JAC continued unabated till at last the Council was housed in a portion of the Birsadih Club on rent. The present office was inaugurated by the honorable Chief Minister Sri Arjun Munda on 13.12.2003 under the Chairmanship of the then HRD Minister Sri Pashupati Nath Singh. We would like to greet “ALL THE BEST” to you for your bright future. We are very happy for you being here. Thanking you for visiting our site and reading our post. We ensure that we will update our site with more fine points regularly. In the last year, there is a exceed number of girls than boys who have attended for the Secondary and Higher Secondary Examinations and they scored best grades in the examinations. MATRIC KA REUSALT KAB ANNE BALA HE JHARKHAND BORD EXAM AND TIME KAB AAYEGA SIR. agar additional subject me fail ho…gye to any problem..